To be innovative, inclusive and international University ; committedto excellence in teaching, research and knowledge transfer and to serve the social, cultural and economic needs of the nation". Our vision is to provide Internationally comparable quality higher education to the youth. The aim is not only focused on imparting subject knowledge and skills, but also to mould the students with better conduct and character committed to the societal needs and national development. Enshrined with the motto “Educate to Elevate”. The University strives to realize the vision of India and excel in promoting and protecting the rich heritage of our past and secular ideals of the nation. My Dear Faculty, Staff, Students, Friends and Well wishers! It gives me immense pleasure to greet each and every one of you as the Vice Chancellor of Bharaithiar University, which undoubtedly is one of the Best Universities in the Country. I am proud that our University is standing tall and steadfast in its commitment to provide Qualitative Education for the Students. 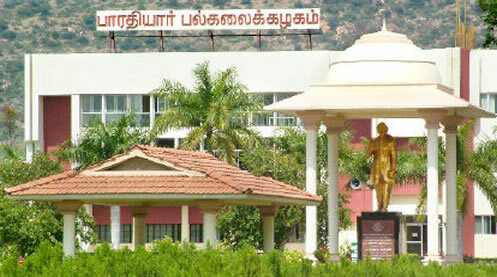 Bharathiar University is renowned for its Environmentally friendly Campus with a well equipped Infrastructure, Outstanding Faculty with Experience, Valuable Research and Academic Programs, and Dedicated Staff. I wish to record my deep sense of appreciations to all the Departments and to their Staff for their remarkable accomplishments. It is worth placing on record that the Officers and Staff of the University are working untiringly towards taking the University to greater heights in the field of History of Higher Education in the Country. As the Vice Chancellor of this University, I wish to pledge my sincere and truthful, dedicated and planned hard work in leading this Institution with a spirit of rejuvenation and enthusiasm with the interface of Team Work. In this regard, I must state here that all my energy and experience in the field of Higher Education will go towards the Development of the University with Vision and Compassion. The Indian Education System is not only the largest system in the World, but more importantly it is even the oldest educational system this World has produced, which encompasses the transfer of knowledge with values that will dignify the very existence of human beings in the Society. History and Culture will testify the central place that Education occupies in the Society in India. Today in the modern Post Liberalization era Indian Education has to recon itself with modernity and adaptability with Scientific and Technological Development. I am happy that the Bharathiar University at present is implementing numerous programs with premier institutions in India which includes the Defence Research and Developmental Organization DRDO. It is my earnest wish that Our University must Tie-up with Internationally Renowned Universities and Institutions which will ensure that we are accessible with the Cutting Edge Technology in its recent forms. The University will need to examine the way to put a Technology Interface Network in the Country which can usher greater transfer of Technological Components into the Society. Concerted efforts will be taken to facilitate advancement of Research activities in the University in multifarious disciplines. Our University is on the path of expansion, in terms of adding new Infrastructure and Systems, for which we will take all efforts to tap resources from National, International and Corporate Sources. The University will be a dynamic place with The University’s Motto “Educate to Elevate” will be a guiding light in our pursuit to provide Qualitative Higher Education to the Students, who can be a catalyst to greater Social Change. As the Vice Chancellor I will strive to amalgamate the various resources and systems of the University to ensure that our University will focus on 3 E’s – Enrichment, Enlightenment and Employment. Let us stand up to the cause of facing the challenge and work unitedly for making Bharathiar University a “Brand of Universal Quality”.